If you try to look for homemade cat treat recipes online, you’re more than likely going to find a lot of catnip-based recipes. 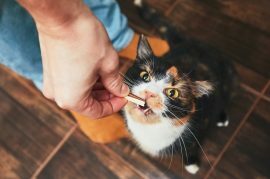 While these kinds of treats are often safe for cats in smaller doses, they don’t exactly give you many options to choose from when you’re trying to cut down on the amount you spend at your local pet store. That’s why we’re going to make sure your cat gets the same level of quality at home that he gets from the store, starting with this recipe for honey and tuna cat treats. If you think your cat would love this recipe, then let’s get started! Preparation time: 30 minutes. Cooking time: 15 minutes. In a small pan on low-medium heat, roast the fresh tuna until cooked. Allow the meat time to cool down, and then break it up into very small pieces. Peel and grate the carrot. In a medium-sized bowl, whisk the egg before adding the carrot, the cooked tuna, and the Manuka honey. If you need to, add a little rice flour, mixing until eventually a consistent dough forms. Take the dough and use it to form small balls that are the right size for your cat’s mouth, sprinkling with a little more rice flour. Set these dough balls onto a baking sheet lined with parchment paper, and then bake them between 10 and 15 minutes or until they appear to have cooked through. Allow the treats time to rest and cool to room temperature. From there, you may serve these treats to your cats. You can store them in a sealed, airtight container in your cabinet or pantry for up to one week or in your freezer for up to three months. Note: Try to avoid feeding your cats over four treats per day, and young kittens shouldn’t be given any at all. This recipe uses tuna as a main ingredient, and while a cat’s diet includes various types of fish, tuna is least recommended out of all of them, given the high levels of mercury. If you want to choose a different kind of fish for this recipe, sardines should suffice. If you need to order some Manuka honey to make these treats, click here. And, remember, we offer FREE shipping on all orders of $150 or more!